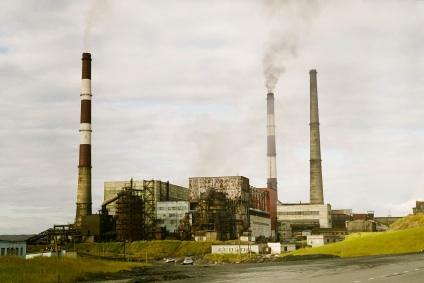 Nickel is released into the air by industrial plants. Nickel is a naturally occurring metal that is silvery-white in color. Some scientists believe that the Earth's core is made up of nickel and metallic iron. It is combined with other metals, such as iron, zinc, copper, and chromium to form alloys. It is used to make stainless steel, jewelry, coins, heat exchangers and valves. Nickel is also found in soil and when a volcano erupts, it emits nickel. This metal is also present on the ocean floor and has fallen from the sky in the form of meteorites. Nickel can enter the atmosphere from refining plants, as well as from power plants (either coal or oil-burning). Trash incinerators also release nickel into the air. Once it is airborne, the nickel attaches to dust in the air. Over time, the nickel dust falls to the ground or mixes with rain or snow, where it enters the soil. In the early 1990s, an American astrophysicist named Thomas Wdowiak put forward the theory that nickel contained in the asteroid that struck the Earth 65 million years was responsible for the mass extinction of the dinosaurs. When the asteroid broke down, the resulting soot released into the atmosphere was loaded with nickel. The nickel-laced soot found its way into the soil and the water. The presence of nickel effectively poisoned the vegetation that plant-eating dinosaurs ate, leading to their extinction. Carnivorous dinosaurs, robbed of their food source, were also wiped out over time. The meteorite in question has been estimated to be approximately 10 km in diameter, and the nickel fallout would have been somewhere between 130 and 1300 ppm (parts per million). The level usually found in soil samples is 15 ppm; at 40 ppm, the nickel concentration is considered toxic. These symptoms are similar to pneumonia, but may be fatal in the case of nickel poisoning. If you suspect that exposure to nickel is the reason for the symptoms, do share those concerns with the doctor. The person suffering from nickel poisoning will be given oxygen. A urine sample will be taken to determine the level of nickel present in the patient's body. Chelation therapy will be started. (Chelating agents are used to remove heavy metals from the body.) Sodium diethyldithiocarbamate (a salt) is administered, along with antibiotics, oxygen, and corticosteroids (steroids that are produced by the body's adrenal cortex). Bed rest will be ordered. A person being treated for nickel poisoning may also have been exposed to carbon monoxide; that condition will also need to be treated.